Lokad delivers the best supply chain decisions that technology can produce. Decide when to reorder and how much to reorder. Decide when to produce more or when to liquidate. Decide how to re-balance stocks between locations. We provide an end-to-end solution that accounts for every demand pattern and every constraint that applies to your supply chain. Inventory is a balance between the cost of stock and the cost of stockouts. Lokad not only forecasts the future demand in ways that are uniquely applicable to supply chain optimization, we also take into account all of your economic drivers to make the most of every single unit you buy. We do not merely minimize percents of forecasting error, but dollars or euros of error. In order to generate a purchase order there are so many variables to be taken into account that it can be overwhelming: future demand, varying lead time, minimum order quantity, past stockouts, price breaks … yet Lokad manages as many drivers and constraints as it takes to produce the exact numbers needed by your company. You can also check out our section dedicated to our forecasting technology. 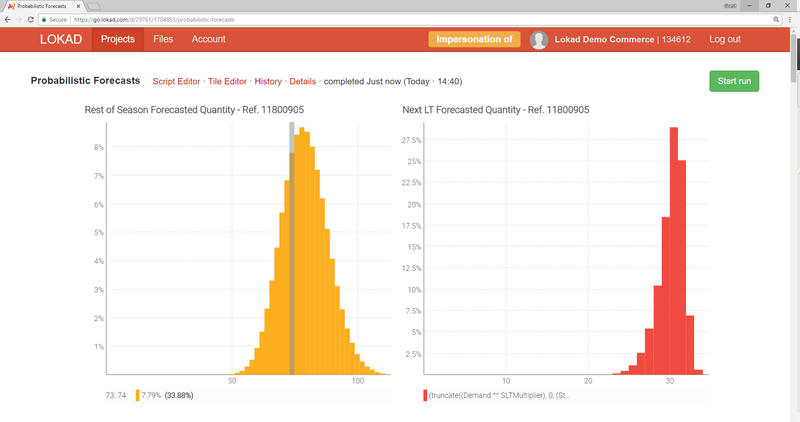 Lokad has developed a forecasting technology that is uniquely suitable for supply chain optimization. We deliver probabilistic forecasts, which are about the only statistical method that works when dealing with erratic or intermittent demand. Our commitment is to deliver the best forecast that technology can produce. Our technology leverages machine learning and big data. We also use high-dimensional correlation between products. Indeed, when considering products in isolation, there is usually not enough data to produce an accurate forecast. Our forecasting engine doesn't require any statistical skills to be operated as it auto-configures itself based entirely on the data that is provided. Compared to traditional approaches, it doesn't only save months of work, but it also contributes to increased accuracy. Optimizing the purchase orders is not only a delicate operation - it should not just reflect the future demand but all the economic drivers as well - it’s also usually a very time-consuming operation. Lokad completely streamlines this challenge. We combine the probabilistic forecasts produced by our forecasting engine with all the relevant economic drivers for your company: carrying costs, cost of stock-outs, gross-margins, shipment costs, in order to calculate purchase order quantities that maximize the returns for every single dollar or euro that you put into your inventory. When we say that we can deliver your next fully optimized purchase order in 1 click, it’s not exactly true, because Lokad can actually schedule the operation to bring to down the actual number of clicks to zero. In any case, we strive for full automation to refresh all your numbers as frequently as you need them. Composing a purchase order that fulfills all of the constraints can feel like solving a Sudoku grid: you need to take into account many overlapping constraints. Lokad manages all those constraints, including the complicated ones. Minimal Order Quantities come in many flavors: quantity per item, quantity per order, quantity per batch, quantity per shipment, lot multipliers. Lokad supports all of these variants, and even all combinations of these variants. With overseas imports frequently comes the constraint of purchasing up to a full container, or half of a full container. Optimizing that space means saving money and time. 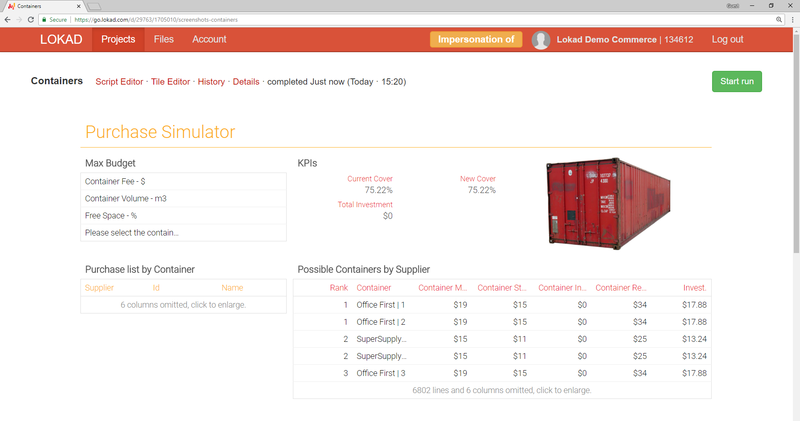 Lokad composes reports that allow you to maximize the content of each container and minimize the cost. You can’t optimize what you don’t measure. 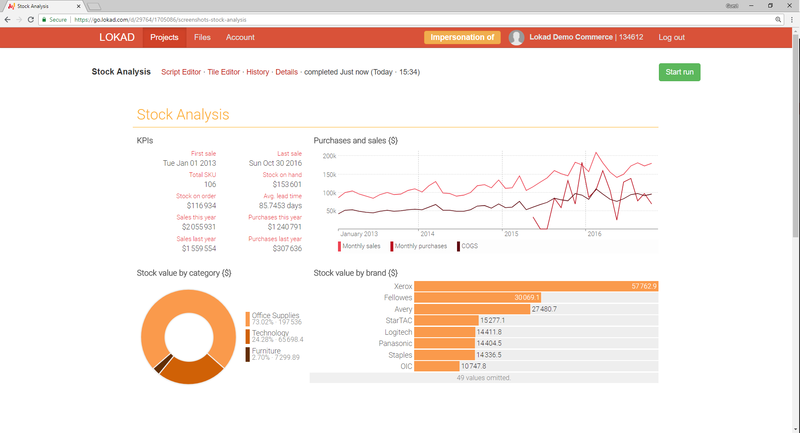 With Lokad, you can craft the exact KPIs that your business needs to track its inventory performance. 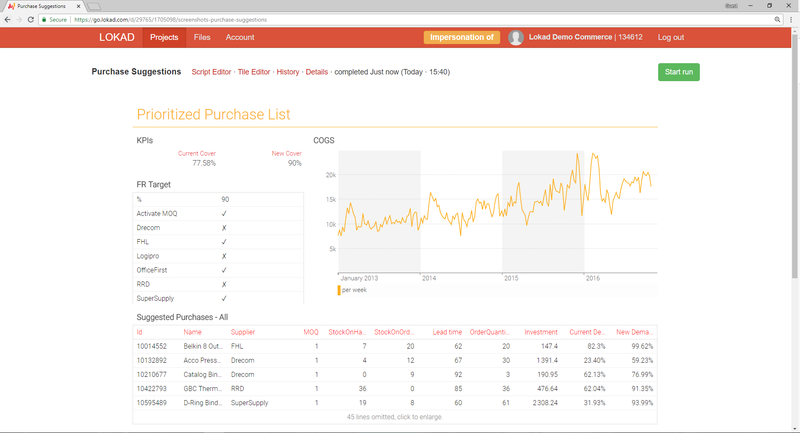 Naturally, we also use it to track the performance of Lokad’s own inventory suggestions. Unlike solutions that force you to drill-down through walls of vanity metrics, Lokad lets you gather all of your KPIs into one page. Naturally, you can create as many dashboards as you like, each time crafting the exact set of metrics that you want to see together. Even the most complex dashboards rarely take more than 500ms (half a second) to be displayed. All of our dashboards are fully pre-computed for near-instant display no matter how many gigabytes of input data have been processed to produce those numbers. Our dashboards can be embedded into any third-party webapp as long you can insert a tiny HTML snippet (iframe inclusion). Lokad supports full collaborative approaches where everyone can look at the same numbers at the same time. Lokad offers a cloud-based file hosting service that is tailored toward business data files. In order to deliver demand forecasts or optimized prices, Lokad can process any file hosted in your account. 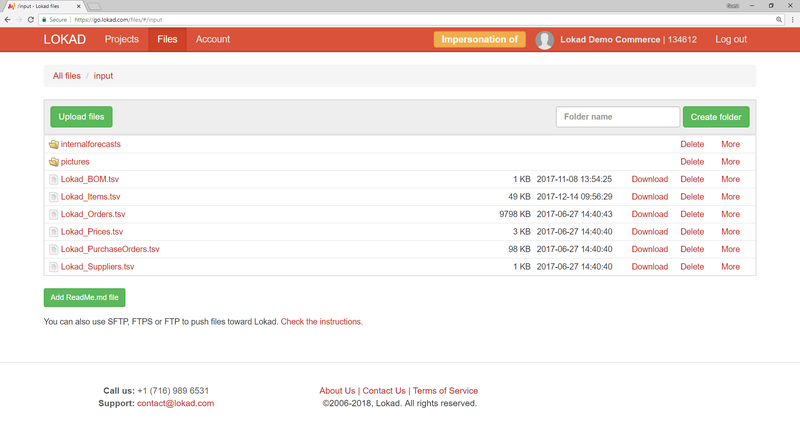 Lokad loads and processes tabular files that are stored in your account. Lokad supports a wide spectrum of data formats such as CSV or Excel sheets. 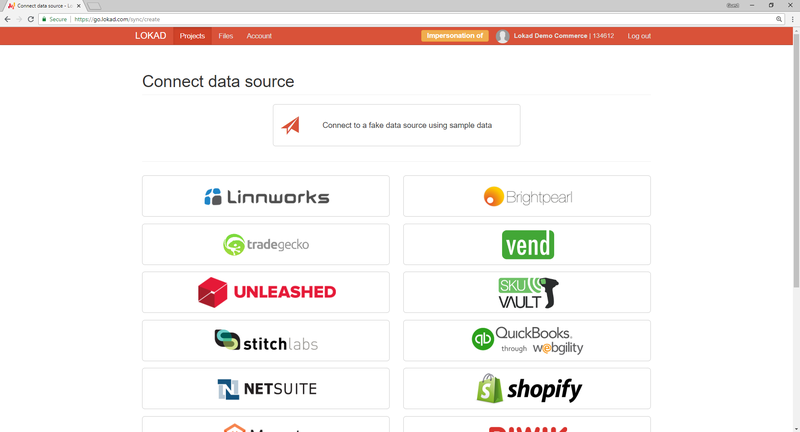 If your company uses one of our built-in integrations, your business data import will be handled automatically. However, it is also possible to load files manually or use automated file transfer protocols, such as SFTP, FTPS and FTP. Everything in Lokad can be exported as Excel sheets or flat files (CSV). Those data files can be download through the web, and directly injected into your Lokad account in order to offer the possibility to perform a programmatic retrieval through (S)FTP. Not enough time to start scripting? Just get an expert from Lokad to handle this for you. When it comes to business optimization, every single detail matters. In order to cope with all business rules, no matter how complex, Lokad has designed a programming language - Envision - specifically tailored for commerce. Excel has some very good properties: it keeps the data very close to you, and it gives you a lot of flexibility to define your own rules or calculations. 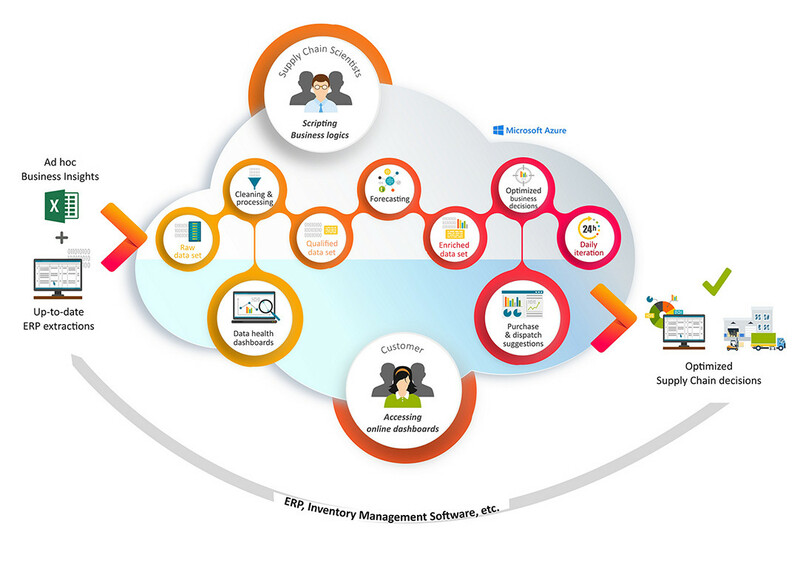 Envision provides the same features, but powered by the cloud. With Envision you can process files much larger than you could ever do with Excel. Generic programming languages are tough precisely because they offer the possibility to do anything. 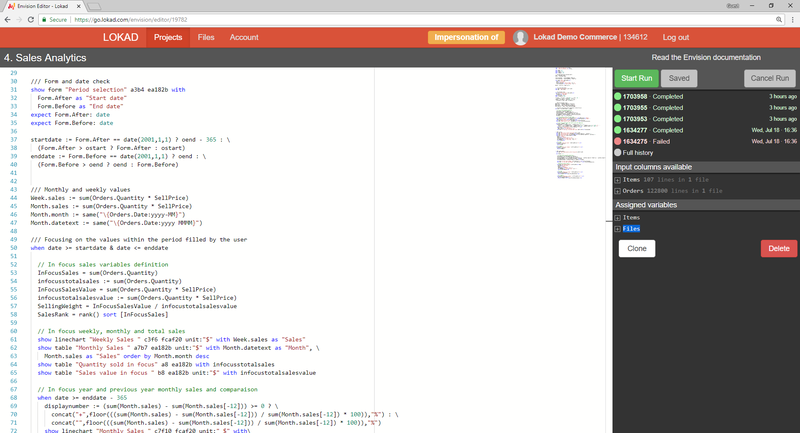 However, Envision is very unlike those languages: Envision is accessible to anyone fluent with Excel formulas. The "trick" behind Envision is a narrow focus: Envision is completely focused on commerce, which eliminates entire classes of problems. Advanced forecasts are more accurate, but can’t be computed in real time. 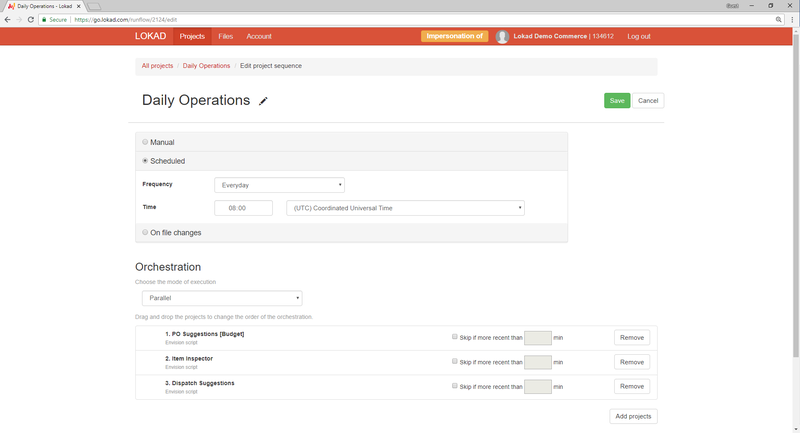 However, Lokad lets you orchestrate and schedule all the calculations so that the numbers are ready whenever your company needs them. Advanced forecasts necessitate data from multiple operations. Lokad provides a possibility to define a specific order for running projects. In this way, the updated data from previous runs can be used in other projects, as the run will only start when the previous one is completed. This allows you to always have the most accurate reports possible. Would you like to have your reports ready on a regular basis? Whether you wish to run your projects every day, week or month, with Lokad’s scheduling tool this will be done automatically. By scheduling the runs at a specific moment of the day (or night) this also allows you to always have your reports ready when you need them, without waiting. Tired of unbearable processing delays and limitations? With Lokad, processing dozens of gigabytes is painless, and processing multiple terabytes requires only minimum effort. Our data storage and data processing are distributed on a cloud computing platform – Microsoft Azure. This way, your calculations don’t get stuck as they would when being processed on a single server. In this respect, our approach is similar to alternative Big Data solutions. However, in addition, Lokad has been fully optimized to handle specific situations encountered in commerce, manufacturing and supply chain. Here, we are typically an order of magnitude faster compared to generic solutions. Lokad lets your company process up to multiple terabytes of data almost effortlessly. 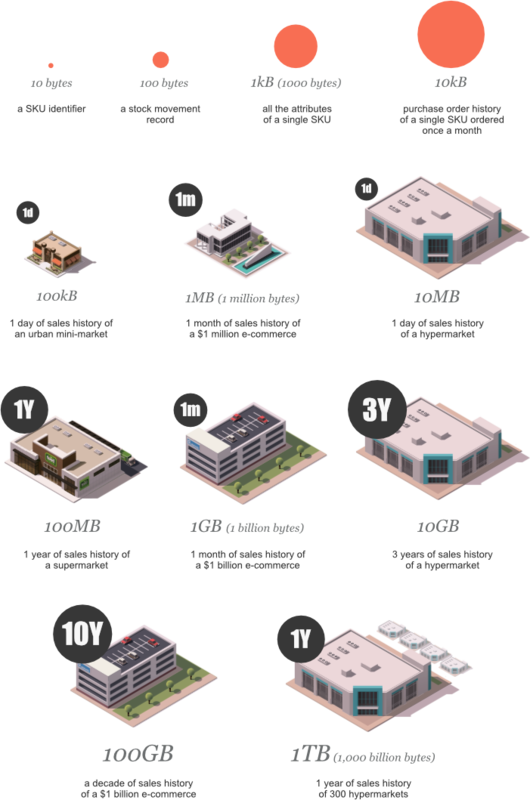 We believe that we deliver one of the lowest TCO (Total Cost of Ownership) on the market when it comes to terabyte processing (1 terabyte = 1000 gigabytes). First, Lokad is a PaaS (Platform as a Service), meaning that your IT won’t have to deal with yet another cluster of VMs. Second, our algorithms have been intensively adapted for managing inventory or situations relating to pricing; frequently yielding massive speed-ups over generic approaches. Lokad provides native support for a series of third-party apps. Simply connect your application to Lokad and the data is delivered automatically to our system. When your app is supported by Lokad, importing data and creating the necessary files is a process that is completely managed by us internally. However, when this is not the case, it is also possible to import files into Lokad manually. See also the full list of supported apps. Lokad is more than just a software: we also provide an end-to-end inventory optimization service where we guide you in your inventory management and advise you based on the unique needs of your business. While our technology is accessible in self-service mode, Lokad also delivers inventory optimization as a service. With the managed accounts, we adopt the mindset of doing whatever it takes to deliver the inventory performance sought by the client. Lokad's team is here to deliver hands-on assistance based on our significant experience in optimizing commerce of all sizes, in nearly all market segments all around the world. Our managed accounts benefit from an end-to-end service solution, where our Supply Chain Scientists take care of crafting an optimization logic entirely dedicated to your company. Time to change your view on Supply Chain. Discover the Quantitative Supply Chain. Lokad’s compendium on Supply Chain. From basic concepts to advanced statistical topics. From classic to probabilistic forecasts. See what cloud computing and Deep Learning can bring to Supply Chain inventory optimization.